[Okanagan Valley, BC] Seven leading BC wineries: 50th Parallel Estate Winery, Culmina Family Estate Winery, Haywire Wines, Liquidity Wines, Painted Rock Estate Winery, Poplar Grove Winery, and Summerhill Pyramid Winery, have formed a partnership, The Okanagan Wine Initiative. The association groups together these seven Okanagan wineries to share resources and collaborate on varying projects internationally, across Canada, and in their home market, British Columbia. The members share a common passion to drive one-another to excel and adopt best business practices and to help elevate the identity of the Okanagan as a premium wine producing region and superb wine tourism destination. The seven members found themselves working together over industry issues or attending wine trade fairs abroad and discovered common values and aspirations, most notably around export market development, sustainable business practices and a desire to create terroir driven wines that showcase the Okanagan. Over a year ago, they started informally sharing resources and more recently decided to establish The Okanagan Wine Initiative as a company. Each member has provided significant funding that will support market development and promotional activities. Once the group is firmly established and its processes and activities in place, other likeminded wineries with similar aspirations will be encouraged to join. The Okanagan Wine Initiative is in no way a replication or replacement for any of the current trade marketing associations in BC. "We are non-partisan and will work closely with all existing trade organizations, in addition to driving our own initiatives," says Liquidity's Ian MacDonald, a key force behind the group's formation. "The Okanagan Wine Initiative is about adding to what is currently being done to elevate awareness and demand for Okanagan wine around the world." "This group is here to challenge and build one another up to be the best we can be in all areas of our business," says Christine Coletta, co-owner of Haywire Wines in Summerland, BC. 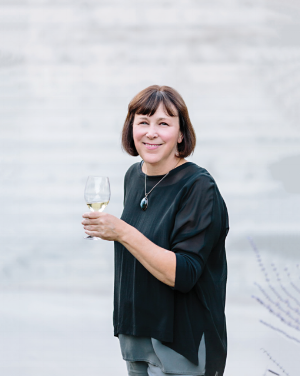 "Collectively, we offer wines and tourism experiences from north to south, and we create a diverse portfolio, focusing on wines that are signatures of the Okanagan," Coletta continues. Recently the group came together to host the event 'Farm Friends' following the Alberta BC wine boycott, and also held a public tasting and panel discussion for the Everything Wine tasting Lab in Vancouver. Next up is a series of events in London in mid-May and co-hosting a tour in the Okanagan for seven UK journalists. "Each of us brings a different skill set to the group and by dividing the work between us, we hope to make fast in-roads," noted Culmina's co-owner Don Triggs. "Our end game is to build our wine region's reputation nationally and internationally." The Okanagan Wine Initiative was formalized in 2018 by a group of winery owners seeking to elevate the region's rich and diverse narrative through business excellence and the promotion of quality Okanagan wines outside of British Columbia, Canada. Founding members include 50th Parallel Estate Winery, Culmina Family Vineyards, Haywire Wines, Liquidity Wines, Painted Rock Estate Winery, Poplar Grove Winery, and Summerhill Pyramid Winery. Their mandate is to work together to improve all areas of viticulture, winemaking and winery operations, market development and sales, by sharing resources and expertise, and to go to market as a group under the banner of The Okanagan Wine Initiative. A collection of member wines will be selected annually to benchmark the region's style and diversity at national and international events and tastings. 50th Parallel Estate, truly one of Canada's exemplary destination wineries, is set in Lake Country on a stunning 61-acre southwest-sloping site. Panoramic lake views, a warm, dry climate, the sun, the lake reflectivity, the slope of the land, and feldspar granite soils combine to provide the perfect place to build an enclave for Pinot Noir, with the first release in 2011. The winery building was constructed specifically to handle Pinot Noir, utilizing the natural slope of the site and gravity to gently process the grapes, rather than mechanically pumping the juice and skins. Proprietors Curtis Krouzel and Sheri-Lee Turner-Krouzel invite you to try their internationally-awarded Pinot Noir and aromatic white wines, and in 2018, 50th Parallel opens its new winery fine dining restaurant, event hall, and 'Transparent' tasting room. Culmina Family Estate Winery is the result of a lifetime of experience in the wine industry for Don and Elaine Triggs. Purchasing raw land in 2007 and joined by their daughter in 2012, the Triggs began developing their new estate, naming it 'Culmina'. Latin for 'peak', they chose the name to reflect not only their lifetime of efforts in the wine industry, but also their desire to coax the highest quality grapes from their Golden Mile Bench terroir. Culmina's vineyard and winemaking practices are grounded in precision-management and scientific tenets, stemming from a desire to make Icon quality wines that reflect the uniqueness of their terroir, as well as an underlying commitment to sustainable vineyard practices, gentle handling of fruit, and minimal intervention of wine. This philosophy has informed every decision since the project's inception, including the mapping of the vineyard's 44 micro blocks, the design of the winery's state-of-the-art production facility, and the release of a wide number of critically-acclaimed wines from the estate. The journey began in 2006 when Christine Coletta and Steve Lornie planted a 10-acre site in Summerland with Pinot Gris and named it Switchback Vineyard. Three years later, after a lot of trial and labour, a tiny crop capable of making 168 cases was harvested. Curiosity won out over practicality, Haywire wines were launched, and there was no turning back. In 2010 consulting Tuscan winemaker Alberto Antonini arrived and the following year, his colleague Pedro Parra, from Chile joined him. The pair make regular trips to advise the winery and vineyard teams and have been instrumental in shaping a vision which includes precision viticulture, organic farming and minimal intervention winemaking. In 2011, Coletta and Lornie opened Okanagan Crush Pad, an innovative custom winemaking facility, to give Haywire a home. Today, their venture includes 380-acres of organic vineyard and farmland. Signature wines include Pinot Gris, Pinot Noir, Gamay Noir, Sauvignon Blanc and traditional method sparkling. Haywire is recognized as making game-changing wines with New Zealander Matt Dumayne at the helm. The team is committed to farming organic wines that let the natural beauty of the Okanagan Valley shine through. Liquidity Wines in Okanagan Falls, uses sustainable, time-tested viticultural practices to provide the finest growing environment for the 100% estate grown vines and hand harvested grapes. 10,000 years ago, glaciers covered the landscape deposited sand and gravel soils on the south-facing property, creating the ideal growing conditions for fruit. Winemaker Alison Moyes' goal is to produce authentic, expressive wines of the highest quality. The winery's 2016 Reserve Chardonnay received the top award at the 2018 Chardonnay du Monde. Visitors treat their senses when they visit the cutting-edge winery, bistro and gallery. All design aspects of this property have been carefully chosen by the owner, Ian MacDonald, so wine lovers may sample award-winning wines while surrounded by wonderful modern art. Visitors also enjoy delicious, locally-sourced cuisine from the Liquidity Bistro, as they take in the views of the surrounding landscape and the ever-evolving art installations throughout the grounds. Painted Rock Estate Winery began in 2004, on a 56-acre west sloping property, surrounded by an amphitheatre of rock bench, on the eastern shore of Skaha Lake in south Penticton. The long, hot summer days, in conjunction with ideal air flow and soil structures of the site, allow proprietors John and Trish Skinner to create terroir-driven wines and build a family legacy business. 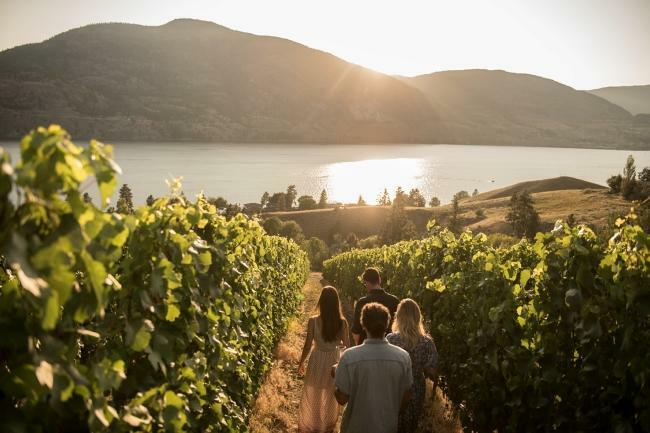 The Skinners assembled local and international talent to realize their vision for an ultra-premium Okanagan winery, planting the single vineyard estate with Chardonnay and Syrah, in addition to the five Bordeaux varieties. Their consultant, Alain Sutre of Ertus Consulting in Bordeaux, oversees the blending and winemaking team each vintage. At Painted Rock, John Skinner personally welcomes visitors to the architecturally-distinctive tasting room, to taste the results of his family's shared ambition to make terroir expressive Okanagan wines. One of the original five wineries on the Naramata Bench, Poplar Grove Winery was founded in 1993. Tony Holler purchased Poplar Grove and became winery president in 2007. Tony's wife, Barbara, owns and operates the Holler's 100 acres of estate vineyards, while their sons, Chris, Andrew, Matthew, and Eric, manage the vineyards with a passionate desire to bring the Okanagan's full potential into each bottle. Poplar Grove is focused on six core wines: Chardonnay, Pinot Gris, Merlot, Cabernet Franc, Syrah and a signature blend called The Legacy. Visit Poplar Grove and experience breathtaking views of the Okanagan Valley while sipping on a selection of these signature wines. Stay for afternoon tapas, lunch or dinner at the Vanilla Pod restaurant. While visiting, join the Poplar Grove Wine Club and their journey to make truly great wines. Summerhill Pyramid Winery, located since 1991 in the Lakeshore district of Kelowna in the Okanagan Valley, is Canada's largest certified organic winery, BC's first Demeter certified biodynamic vineyard, and Canada's foremost producer of sparkling wine. The winery, owned by the Cipes family, is also home to the Sunset Organic Bistro, a 200-seat, organic restaurant featuring fresh, seasonal wine paired menus and a panoramic view of Okanagan Lake. The winemaking philosophy is that organic and biodynamic is the royal road to producing exceptionally beautiful, authentic, terroir-based wine. The portfolio of 100% BC wines has earned the winery the title of 'Canadian Wine Producer of the Year' at the International Wine & Spirits Competition in London, England, as well as numerous international trophies and medals at the highest levels of competition.